These preprimary students are very excited to be working with Montessori materials at age 2! Accommodating children from ages 2 years through 10 years (and soon to be 12 years) and ultimately comprising four programs, including preprimary, primary, elementary, and middle school, The New Century School has always focused on how to make the transition from program to program as smooth as possible for students. Continuity is built into the school’s approach, arising as a very natural consequence from its philosophy and mission. No matter what point a TNCS student starts from, he or she is headed toward the same basic goals of self-motivated inquiry and discovery as well as how to be a nice person along the way. This tiny TNCS tot is exploring multiple dimensions with the Graduated Cylinder Blocks. Perhaps the most challenging transition that TNCS students (and their parents) face is moving from the preprimary program up to the primary program when the child turns at least 3 years old. At age 2, they might well still be in diapers—still babies, practically—then, a year later, they enter a completely new milieu, with new teachers, new classmates (most of whom are older), and a whole new set of expectations. They become, in short, tiny students. Historically, this shift has always been more difficult for the parents. The toddlers, meanwhile, accept these changes more or less in stride, even eagerly. It’s safe to say that the children’s ability to adapt so quickly and so well has a lot to do with TNCS’s very well-considered transitional process. On Thursday, February 5th, Head of School Alicia Danyali and the three preprimary teachers, Mrs. Reynolds, Lin Laoshi, and Señora Ramos held a Preprimary Workshop to walk parents through what this process entails. It was a full house; preprimary parents are clearly curious, if not anxious, about what lies ahead for their kids. Rest assured, Mrs. Danyali’s and the teachers’ presentations allayed all concerns! The two biggest differences between the programs is that the primary classroom is not a language immersion environment, and it is a classic Montessori environment. These differences start to become less striking, however, when you consider that the children are introduced to the Montessori materials as well as the Montessori teaching style of nurturing guidance the moment they step foot into the TNCS preprimary classroom. Thus, 3-year-olds will enter the primary classroom with a good deal of familiarity with their surroundings and with the manipulative materials they will be working with. And, as with the preprimary classroom, the primary classroom is specially engineered and furnished to accommodate their size. For more on how the Montessori classroom functions at TNCS, please read previous Immersed posts “Language, Math, and Science—Montessori Style!,” “Inside the Montessori Classroom,” and “Preschool Conundrum Solved: Research Demonstrates Benefits of Montessori Education.” The main point here is that Maria Montessori knew that kids need, above all else, to feel secure for optimal development; therefore, in the TNCS Montessori primary classroom, new skills are introduced when the child is ready for them, not when the calendar arbitrarily dictates. This TNCS preprimary student practices her fastening skills on the Montessori Button Frame. She is well on her way to independent dressing! Some of the current preprimary students have only just turned 2. Their parents might be wondering how conceivable it really is that their child might be sharing a classroom with kids who are starting to read and write in under a year from now. In diapers in May but using the bathroom by late August? Able to don outdoor clothing independently? Able to articulate daily needs? Those are some of so many hurdles jumped for lots of kids, towering obstacles for others. These are, however, prerequisites for moving up to primary. No matter where your child falls along that continuum, the overriding message that emerged from Mrs. Danyali’s presentation was that the child will be supported and nurtured along the way to readiness. These benchmarks are not in place for ranking or comparing student achievement, by any means. They are simply necessary from an operational standpoint. The primary teacher cannot sacrifice time away from giving the very specific Montessori lessons or helping a student master a task to change diapers, for example. The primary student is able to use the bathroom and get dressed to go outdoors more or less independently (assistance and guidance are always readily forthcoming, of course, and supervision is a constant). This might sound rather stark at first. In fact, however, the first steps toward such independence have already been taken in the preprimary classroom, where independence and competence are very tenderly fostered. The TNCS student has become a fairly autonomous classroom resident even at age 2, as Mrs. Reynold’s gorgeous photos attest (also see slideshow below). Their ability to pursue their own interests will serve them very well, academically. 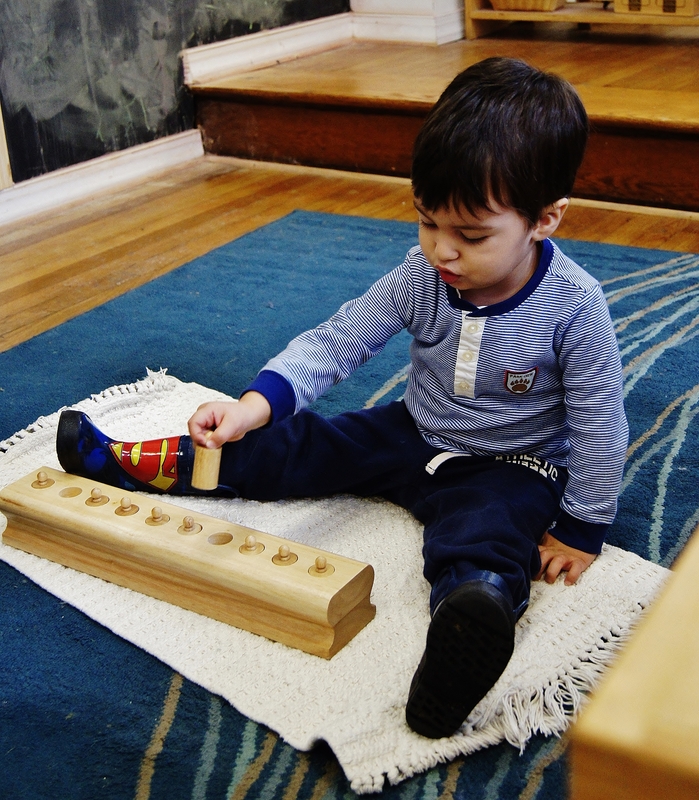 They are internalizing/honing the four pillars of Montessori: Concentration, Coordination, Independence, and Order. Order? Indeed. Primary students are not only expected to select an activity that they want to work with, but they are also expected to complete that work as well as put it away correctly upon completion—it’s the Montessori “Work Cycle,” and it teaches accountability and a sense of accomplishment in addition to the importance of maintaining order. All “works” are designed to absorb the child (concentration) and also to develop both large and fine motor movements (coordination). Parents are encouraged to reinforce the expectation of independence at home as well. Children can be allowed to pour their own drinks and zip up their own outerwear, for instance. Pants with elastic waists and shoes that fasten with velcro straps can facilitate their ability to get dressed by themselves and develop their confidence with such processes. Another way parents can aid such transitioning is by considering a TNCS summer camp for primary-age students rather than a preprimary camp to give them a taste of the fun in store. Although not an exact science, this aspect of the transition out of preprimary is very thoughtfully undertaken. Many factors are weighed in the decision-making: your child’s proclivities, the prospective teachers’ proclivities, and the ages and genders of the current students in the class. Each Montessori classroom should have a well-rounded mix of ages 3, 4, and 5 in order to function optimally. (Please see above links for the rationale behind the mixed ages of Montessori classrooms. In short, they promote incredibly fruitful mentor–mentee relationships that continuously evolve.) The child will remain in the primary classroom for 3 years, so a “good fit” is critical. TNCS may not be able to honor specific requests in all circumstances, but your child will always be placed in a classroom environment fully devoted to addressing each student’s needs. Attend an Admissions Fridays event held most Fridays through the end of the school year (register here). Read Mrs. Danyali’s recommended books Montessori: The Science Behind the Genius (Angeline Lillard) and A Parents’ Guide to the Montessori Classroom (Aline Wolf). This entry was posted in Early Childhood Education, Montessori education, Multilingual Education, Parenting, Progressive Education and tagged A Parents' Guide to the Montessori Classroom, Admissions Fridays, cultivating indepence, mixed-age classroom, Montessori classroom, Montessori education, Montessori: The Science Behind the Genius, school transitions, The New Century School, TNCS, work cycle. Bookmark the permalink. ← TNCS Welcomes DBFA and the “Big Kids”!